Despite the formidable scholarly literature on the Holocaust, there is still comparably little work that examines how Europe’s Jewish communities approached the daunting task of reconstruction after the war. Post-Holocaust France and the Jews, an edited volume that grew out of a conference held at Boston University in 2011, delves into this fascinating topic by exploring French Jewish organizational, institutional, and intellectual responses both to the genocide and to the process of rebuilding in the first postwar decade. France is a fitting example here, because unlike most other countries occupied by the Nazis, roughly three-quarters of its Jewish population survived the genocide, and its postwar Jewish community was one of the largest in Europe, numbering roughly 235,000 in the early years after the liberation. The chapters in this volume explore this pivotal period in the restoration of a Jewish political and cultural presence in France, and one of the key themes that many of the authors here take on is that of postwar Jewish responses to the republican project of universalism. For this reason, among others, the volume will be of great interest to scholars of modern France from a range of disciplines. Seán Hand, in his introduction, argues that we need to see the period from 1945 to 1955 as “a deeply foundational process that entails a profoundly transformed status for Jews in France during the twentieth century” (p. 2), and collectively the chapters in the volume shed light on a community reeling from the disaster, but also working to establish a set of new relational identities both within a diverse population, and between that population and the state. The volume draws together chapters representing a range of disciplines--history, literature, philosophy, sociology, and theology--but the disciplinary mix is somewhat uneven, and historians will find more on offer here than will those from other fields. The contributors include an impressive array of world-renowned scholars, and the result is a wonderfully readable and authoritative collection. However, although the wealth of expertise here is considerable, many of the chapters are also somewhat conventional in their methodology. There is much material here that is new and exciting, but the approaches taken are generally solid rather than novel. The book is organized in three sections: the first focuses on established and new Jewish organizations and their relationship with the state, the second explores the fascinating question of how institutions dealt with orphaned Jewish children, and the third looks at intellectual responses both to the Holocaust and to the formation of new Jewish identities in the postwar period. The thread that unites these disparate topics, and quite ably so, is the issue of the relationship between Jews and a republican model that made acknowledging the specificity of the genocide difficult. Many of the authors here argue for a more complex and nuanced picture of Jewish approaches to republican universalism in this period, and the result is a volume that is internally cohesive and offers new insights into the limitations (but also the continued power and relevance) of the republican model after Vichy. The first section includes a useful scene-setting chapter by David Weinberg that explores the complex ways in which rebuilding efforts were shaped by international pressures, the divisions of the Cold War, and the establishment of the state of Israel. Maud Mandel’s thought-provoking contribution uses the issue of immigration to explore continuities and changes in the French Jewish establishment’s attitudes towards pluralism; she convincingly challenges the idea that the Holocaust alone led to a shift in entrenched positions vis-à-vis Jewish immigration, and argues that the process of rebuilding “was as influential as Vichy” in changing how French Jewish leaders gradually turned away from the sectarian divides of the interwar period to embrace a cautious multiculturalism (p. 40). Samuel Ghiles-Meilhac’s chapter on the birth of the Conseil représentatif des israélites de France (CRIF) sets out the early history of this unique organization. Finally, Lisa Moses Leff’s chapter on the history of book restitutions provides a helpful overview of the multiple ways in which a republican model that sought to avoid special policies clashed with the particular needs of Jewish individuals and organizations attempting to rebuild. She uses the atypical example of the French Sous-Commission des livres to show, however, that there were cases in which the state worked in partnership with Jewish cultural institutions, rebuilding a tentative “republican Franco-Judaism” in certain pockets. The second section contains three chapters that focus on the issue of child victims and survivors of the Holocaust. Daniella Doron’s fascinating history of the ways in which competing Jewish organizations used the symbol of the child Holocaust victim to memorialize the genocide is a valuable contribution to an expanding literature on early Holocaust memory. Susan Rubin Suleiman’s chapter on orphans and Jewish identity draws on the memoirs of some formidable cultural figures who were also orphans of the Holocaust--novelist Georges Perec, historian Pierre Vidal-Naquet, and philosopher Sarah Kofman, among others--to detail the complex relations between child survivors and their sense of Jewishness, and how this changed over time. Lucille Cairn’s chapter on memoirs relating to Jewish children’s homes draws some interesting conclusions about why personal memories of these homes may have become more positive over time, but the sources used seem too sparse here (she draws on four texts, only one of which was published before the 2000s) to merit firm conclusions. The final section is focused on intellectual responses to the genocide and to the process of reconstruction. Bruno Chaouat’s chapter maps out how authors in the early postwar period--he homes in on the year 1947 as a key moment--engaged with the question of evil. Jonathan Judaken’s fine contribution on historian Léon Poliakov paints an intriguing picture of Poliakov’s intellectual circle, and reminds us of his importance in establishing the groundwork for the field that would later become Holocaust studies. Edward K. Kaplan’s chapter on philosopher André Neher returns us to the idea that the search for new narratives of French Jewish identity involved some complex negotiations with republican values, and Jay Winter’s chapter on René Cassin further argues that French Jews did not have a straightforward relationship with republican models in this period. By detailing Cassin’s continued devotion to republican ideals, and by showing how this in turn deeply shaped the nature of the Alliance Israélite Universelle during Cassin’s tenure as president of the organization, Winter argues against the claim that French Jews were disenchanted with republican traditions at the war’s end--but although this is a very able study of Cassin in his intellectual sphere, one does wonder how representative Cassin’s take on republicanism was. While the chapters in this final section deftly set out the complex ways in which intellectual and social reconstruction were intertwined in this decade, readers may find the tone somewhat hagiographic in places. Furthermore, in this entire section on intellectual responses, the voices of women are almost entirely absent; there is a “great man” approach to intellectual history, literature, and philosophy here that, while solid, strikes me as rather old-fashioned. Surely in writing a new intellectual history of this intense post-Holocaust period, we should also be searching for new voices? Indeed, readers will note that throughout the volume, the emphasis is on “committees, special operations, and purposeful individuals” (p. 3) rather than on ordinary people or on those outside predictable cultural, political, and intellectual circles, and that leads to a somewhat staid assembly of voices in many of these chapters. 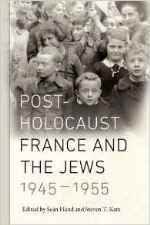 The editors’ assertion that the volume gives a “much more continuous and informed understanding of the life, contribution, and significance of Jews in France in the postwar era” is thus a somewhat bigger claim than what the book actually achieves: the work is less about the Jews of France than it is about their leaders (p. 3). Readers might also feel that, given the subject, many of the chapters are strangely devoid of emotional resonance. In this early postwar period, we are dealing with children, women, and men whose families had been murdered and whose lives and livelihoods had sometimes been utterly ripped to shreds. For all the “hopeful emotions” that energetic individuals brought to reconstruction efforts, this was also a period of impossible grief and shock, numbness and anger. That despair and hope were so tightly bound in this period is precisely what makes it so fascinating. More consideration of the emotional flavor of this moment in French Jewish life would have made these fine chapters sing a bit more boldly and satisfyingly. However, despite these issues, there is much to laud in this important collection. It makes great headway towards giving us a more nuanced and richer picture of the immediate postwar decade, a period in which Europe’s Jews--in France as elsewhere--were not only rebuilding their lives but reimagining their identities and reconfiguring their roles in local and national communities. The volume will be of wide interest to scholars of postwar reconstruction, enriching our understanding of the cultural and political forces that drive renewal and reintegration after conflict. Dr Rebecca Clifford, Swansea University, is a historian of contemporary Europe, whose principal interest is the memory of the Second World War in the post-war period. She is a fellow of the Royal Historical Society and the Higher Education Academy. She completed a DPhil in Modern History at the University of Oxford in 2008, and held a Junior Research Fellowship at Worcester College, Oxford, before joining the department in 2009. Her first book, Commemorating the Holocaust: The Dilemmas of Remembrance in France and Italy, was published by Oxford University Press in 2013.